A shot glass is a small glass which is used to hold a predetermined measure of alcohol. The glass is characterised by its thick wall and bottom and usually is designed to hold no more than 100ml. The thick bottom is designed to absorb the shock of being slammed against the bar, is as tradition. Traditional shot glasses are tapered, with the bottom having a smaller diameter than the top. 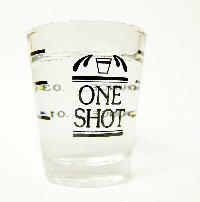 There are different theories behind the origins of the name "shot glass" but it has been used for over 200 years. One of its first uses was for sipping grappa from it in Italy. Today, shot glasses are seen as very collectable as there is a large variety of designs and graphics which distinguish individual glasses. Standard variations include the double and the shooter, which is tall and thinner. In the UK a single shot-glass holds 25ml and a double 50ml.